Worked on my research paper for hours, finally decided to take a cooking break. Was in the mood for Mexican food, so decided to surprise the hubby (since he likes Mexican food) and made Chicken Enchiladas…Enjoy! In a saucepan heat 3 tablespoons oil, add flour and cook, whisking, 1 minute. Add chili powder and cook 30 seconds. Stir in stock, tomato puree, oregano and cumin and bring to a boil. Reduce heat and simmer 15 minutes until flavors are well-blended. Season to taste with salt. Wrap tortillas in foil and warm in the oven. In a pot, bring broth to a boil. Set chicken into broth with bay and onion. Return to a boil, cover and reduce heat to simmer. Poach chicken in broth 15 minutes, until cooked through. Remove chicken to a bowl and shred with 2 forks. Add 1/2 cup of cooking liquid, tomato paste, and salt. Mix well. Remove tortillas from oven and switch broiler on high. Pile chicken mixture on to a warm tortilla and roll. Line baking dish with enchiladas, seam side down. 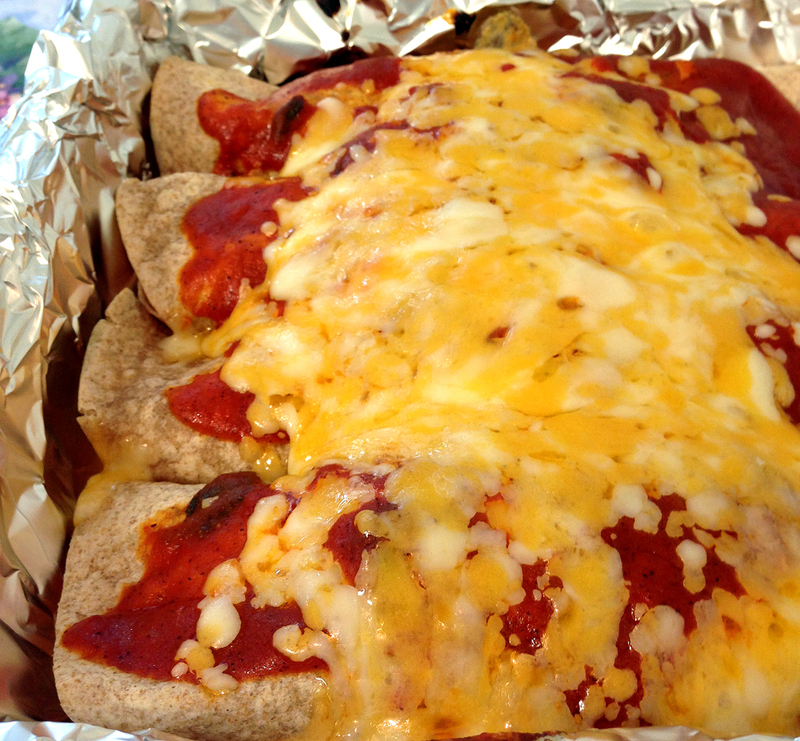 Pour hot tomato sauce over the chicken enchiladas and top with cheeses. Place in enchiladas in the oven and broil for 5 minutes to melt cheese.